Why are most churches still segregated by race and culture? Is it possible to build intercultural ministries today? What are the challenges of creating and maintaining these ministries? How do intercultural churches give equal power and privilege to each culture? How do they avoid assimilating minority cultures into dominant cultures? Intercultural Ministry explores these questions and more with chapters from a racially and denominationally diverse group of pastors, theologians, and teachers who reflect on their experiences and experiments in intercultural ministry. Contributors include Peter Ahn, Amy Butler, Brad Braxton, Brandon Green, Daniel Hill, Angie Hong, Karen Oliveto, Carlos Ruiz, Sheila Sholes-Ross, Christine Smith, and more! "Buried deep in the subterranean recesses of this thoughtful, provoking, timely collection of essays representing the breadth of world Christianity is the fundamental, and ultimately transformative, not to mention far-reaching insight, that diversity, multiculturalism, inclusion, in and for theological education and ministry, are not enough. Their futures, and indeed the future of our planet, depend on the creation and nurture of intercultural competencies that are not only practical, but learned; critical but also hopeful; uncompromising, while being gracious; strategic, and at the same time tactical. 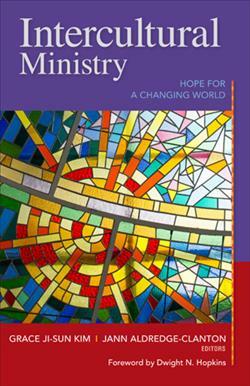 This is a volume that will not only disturb but also comfort, disrupt as well as protect, both the faithful and the cynical, providing readers with 'solid' resources and 'liquid' perspectives for ministry and the living out of their livesespecially in these deeply troubled and troubling times. Jann Aldredge-Clanton, MDiv, PhD, is a feminist theologian, author, chaplain, and teacher who leads workshops and conferences nationally and internationally. She serves as co-chair of the national, intercultural Equity for Women in the Church Community, adjunct professor at Perkins School of Theology and Richland Community College, council member of Christian Feminism Today, co-founder and co-leader of New Wineskins Feminist Ritual Community, and on the Dallas Workers' Rights Board. She is the author of numerous books, including She Lives! Sophia Wisdom Works in the World; Earth Transformed with Music! Inclusive Songs for Worship; In Whose Image? God and Gender, Changing Church: Stories of Liberating Ministers, and Seeking Wisdom: Inclusive Blessings and Prayers for Public Occasions.